The Cheerleaders. Kara Thomas. Young adult/Mystery. 2018. 384 pages. 4 stars. If you look hard enough, you’ll find something that’ll make you wish you hadn’t. After a while, searching for the answers felt like grasping around in the dark. At some point, you have to choose to live in the light. A sure way for me to finish a book in one sitting? Give me a murder mystery. I haven’t had the best luck with murder mysteries because I’ve always been able to figure it out waaay before I was supposed to, but The Cheerleaders was a good read! The story revolves around the deaths of five cheerleaders, seemingly unconnected, but Monica, one of the cheerleader’s younger sister, thinks otherwise. Most of the book was spent on them trying to reach people who were close to the cheerleaders five years ago and suspecting people the main characters were close to. Honestly, it wasn’t as nail-biting as I thought it would be, but it definitely kept me interested enough to forego sleeping. In mystery books, I always look for that oh-my-god moment. That moment where everything falls into place and I’m knocked off my seat but the sheer genius of it. The Cheerleaders sort of had those moments in certain chapters, but never had that One Big Moment™️. (I honestly hope you’re understanding what I’m talking about because if not I’ll just look like a dummy). There were some loose ends that I would have wanted mentioned before the end. Sure, so-and-so was not the killer but the questions raised about so-and-so were never answered. You can’t do that after making me aware of it!! Now I’m gonna think about it before I can move on from this book. Aside from that, my only other issue from the book was text messages in my digital galley, or lack thereof. I wasn’t sure if it was intentional not to show Monica’s responses to whoever she was texting, but I was pretty confused (and annoyed) that I couldn’t see them. In general, the text messages were a chore to read because of its format as well because I could read the responses of whom Monica or Jen was texting but never what they said. Hopefully this will be fixed in the final copies! I’ll be sure to get myself one so I can finally know what they said. 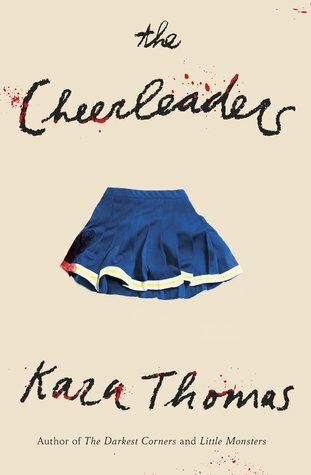 Technical problems aside, The Cheerleaders was a good read and I’m giving it 4 stars! Kara Thomas has been a favorite author of mine since she wrote Little Monsters! I’m glad you enjoyed reading The Cheerleaders ♥️ Great review as always guys! Great review! I’m really excited about this one! I have this pre ordered for my Kindle and now I’m more excited to read it! Didn’t hurt that my name’s Monica too 😊 awesome review! I had no idea it’s a murder mystery! Can’t wait to read it now. Great review!